The P. aeruginosa iron-regulated heme oxygenase (HemO) is required within the host for the utilization of heme as an iron source. As iron is essential for survival and virulence, HemO represents a novel antimicrobial target. We recently characterized small molecule inhibitors that bind to an allosteric site distant from the heme pocket, and further proposed binding at this site disrupts a nearby salt bridge between D99 and R188. Herein, through a combination of site-directed mutagenesis and hydrogen–deuterium exchange mass spectrometry (HDX-MS), we determined that the disruption of the D99–R188 salt bridge leads to significant decrease in conformational flexibility within the distal and proximal helices that form the heme-binding site. The RR spectra of the resting state Fe(III) and reduced Fe(II)-deoxy heme-HemO D99A, R188A and D99/R188A complexes are virtually identical to those of wild-type HemO, indicating no significant change in the heme environment. Furthermore, mutation of D99 or R188 leads to a modest decrease in the stability of the Fe(II)-O2 heme complex. Despite this slight difference in Fe(II)-O2 stability, we observe complete loss of enzymatic activity. We conclude the loss of activity is a result of decreased conformational flexibility in helices previously shown to be critical in accommodating variation in the distal ligand and the resulting chemical intermediates generated during catalysis. 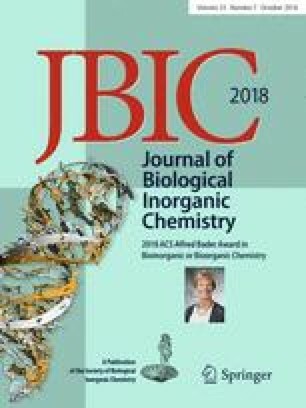 Furthermore, this newly identified allosteric binding site on HemO represents a novel alternative drug-design strategy to that of competitive inhibition at the active site or via direct coordination of ligands to the heme iron. The online version of this article ( https://doi.org/10.1007/s00775-018-1609-x) contains supplementary material, which is available to authorized users. A correction to this article is available online at https://doi.org/10.1007/s00775-018-1619-8. The authors would like to thank Bennett Giardina for technical advice and assistance with the IFP in cell activity assays. GH generated, purified and characterized the D99 and R188 mutants in the WT and HemOα background. WH performed all of the HDX-MS experiments. ER performed the in vitro activity assays. PML performed and interpreted the resonance Raman experiments. GH, WH, AW and PML wrote the manuscript. All authors contributed to final editing of the manuscript and have given approval to the final version of the manuscript. This research was funded in part by pre-doctoral fellowships from the ACS Division of Medicinal Chemistry and the American Foundation for Pharmaceutical Education to Geoffrey Heinzl; NIH Grant T32GM066706; and NIH Grant AI102883 to Angela Wilks.